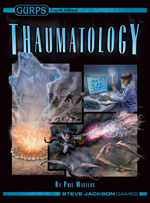 Back in July, we released the PDF version of GURPS Thaumatology. A few weeks later, we sent the file to the printer. During those weeks, fans found a few typos, which were corrected before the physical copies started rolling off the presses. And now, those full-color hardcovers are nearing your local game store. In celebration, we've uploaded a couple of sneak peek pages. The table of contents and introduction chapter are already available. This new batch includes the index, a look at path magic in operation, some tips on using ley lines, and an overview of alchemy schools of thought. Watch for more previews of GURPS Thaumatology in the next week or two, and join in the discussion on our forums. And look for the actual book to hit shelves before Thanksgiving!